Outside the UK? Then click here to order your products. New Formula Enhancements: Added red wine extract Added folic acid Added Vitamin K Increased Vitamin B12 Increased Vitamin B6 Changed sweetener to stevia The combination of ingredients in ProArgi-9+ was meticulously formulated to support exceptional health. This product is pure, potent and formulated to help you live life optimized. ProArgi-9+ can be taken at any time during the day, simply mix one packet with 240 ml water and stir until dissolved. The nitric oxide derived from L-arginine is directly or indirectly implicated in practically every cellular response and health condition imaginable, from the cardiovascular system to the immune system, and hormone function to nerve function. Although an exhaustive list of possible applications for the amino acid is not included, the following are the primary scientifically backed reasons that anyone, even healthy people, should consider adding the L-arginine to their health and wellness regimen. Below are related articles, page and videos. Click here to read the benefits here. 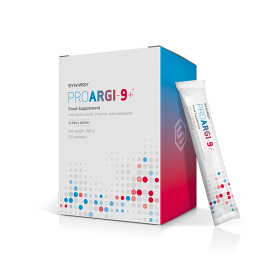 I also started to take ProArgi-9+ and Zambroza about 2 months ago and again the additional benefits became very noticeable within a week or so. My sinusitis cleared, I can now breathe properly through my nose, my early morning ritual of coughing for half hour has almost disappeared completely and I am sleeping more restful. I am sure that there are lots of other benefits that I have not noticed yet as I am still marvelling over these more obvious ones at the moment. Simply mix one packet with 240 ml water and stir until dissolved.